Design-build commercial modular construction firm Ramtech Building Systems of Mansfield, Texas has announced the purchase of four modular buildings by the Humble (TX) Independent School District. Since 2005 the school district has purchased 35 buildings from Ramtech which are currently in use at eleven of its 43 campuses, including portable classrooms and restrooms, combination classroom and office buildings, and a life skills facility. Design-build commercial modular construction firm Ramtech Building Systems of Mansfield, Texas has announced the purchase of four modular buildings by the Humble (TX) Independent School District. The district purchased two of Ramtech’s industry standard portable double classrooms, a multiuse building with two classrooms and two offices, and a 576 square foot boys and girls restroom facility. A long-time customer of Ramtech, since 2005 Humble ISD has purchased 35 buildings which are currently in use at eleven of its 43 campuses. 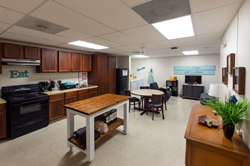 The facilities include portable classrooms, restroom facilities, combination classroom and office buildings, and a life skills facility for their innovative MOSAIC transition program. Designed for students who received special education services through a modified high school curriculum and are ready to actively transition into young adult life, the building features instructional space for eight classrooms, two fully-simulated apartments with kitchens and showers, and a retail store for student manufactured items. To meet the aesthetic requirements of the local neighborhoods where the relocatable modular buildings are being installed, Ramtech substituted its standard metal roof with a 20-year composition roof installed at the company's manufacturing facility. The school district also chose to upgrade the interiors of the double classrooms to include wood grain birch paneling on the walls and special low VOC carpet flooring in the classrooms. All of the buildings have also been constructed and installed to meet the Houston area's 110-mile hour wind load specification. Ramtech expects to finish the installation of the four recently purchased buildings during the beginning of the summer recess. With 43 campuses at locations covering a 90 square mile area, the Humble ISD serves over 43,000 students from the communities of Humble, Atascocita, Kingwood, Fall Creek, and Eagle Springs. The district began over 100 years ago as Harris County Common School District No. 28 with a single one-room schoolhouse. Humble ISD is currently the 31st largest district and is one of the 25 fastest growing school districts in Texas. Since 1982 Mansfield, Texas-based Ramtech Building Systems has been providing innovative relocatable modular buildings and permanent modular construction to educational institutions, government agencies, healthcare providers, and Fortune 500 companies throughout the Southern United States. As a design-build construction company, Ramtech offers full in-house design, a manufacturer direct product, and complete site construction services all within a single-source provider solution. By emphasizing a value engineering approach, Ramtech has successfully completed over 4,000 total projects of diverse sizes across multiple industries. Their school project portfolio includes both relocatable buildings, and facilities built using a traditional pier and beam permanent modular construction, and the company’s flagship slab-on-grade permanent modular construction system. For more information, visit the Ramtech’s website at RamtechModular.com.